Since a young age, Walt Disney was fascinated with trains and this fascination seeped into his dreams for an amusement park. Disneyland features 5 vintage, steam-powered trains that make a 20-minute loop around the park carrying thousands of guests a day. 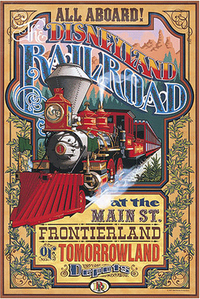 If you have ever gone to Disneyland, you have no doubt seen this train, or heard its whistle, as it travels along throughout the park, but have you ridden it? If you haven’t, I suggest you do! If you can’t (because Disney’s prices are crazy) take some time with me as I take you through the journey. Let us board the train at Main Street Station. Main Street Station, located only a couple yards away from the main gates of Disneyland, is perhaps the most iconic of the train stations because of its vintage feel with large steps that lead to the station and its red brick walls. On an average day, you will wait 5 – 10 minutes to board one of the five trains circling the track. There are two different types of trains: one in which all the seats face forward and one in which all the seats face outward. Your ride is bound to be magical regardless of which train you choose. Boarding the train, you should expect to enter a tunnel in between every station. Some of these tunnels are only a few seconds long while others are more (but none are more than three minutes). Do you hear that music in the hear? Smell the delicious food from one of the numerous cafes? You’ve reached New Orleans Square, home to Pirates of the Caribbean, Haunted Mansion, Splash Mountain, and Tom Sawyer’s Island. FUN FACT! Now before you wonder if something is wrong, please be aware that that noise is INTENTIONAL! Actually, it is the Morse code version of Walt Disney’s Opening Address. Hear that? And we’re off! In between New Orleans Square and Toontown, guests are treated to a spectacular view of the Rivers of America. Here they will experience grand scenery that includes water falls, rivers, Native American chiefs, and beautiful views of the park. Breathe in the fresh air away from the crowds and snap your last shots of Thunder Mountain quickly because here comes the tunnel! FUN FACT! In this tunnel, you will actually pass through Splash Mountain and you can gaze down at all the guests who have just been soaked! Home of the wacky, wondrous whimsical friends of Mickey Mouse, we have arrived in Toontown! If you were to depart now, you would be only steps away from either the entrance to Toontown or from the classic It’s a Small World, but don’t depart just yet! We have one more stop to make! One we depart from Toontown station, we travel behind the facade of “It’s a Small World” and make our way into the longest tunnel of the entire trip. However, this tunnel is more than it seems. Within the tunnel, guests view dioramas of the Grand Canyon and the Primeval World (dinosaurs included). When the Disney Railroad was closed in 2016-2017 for Star Wars land, Disneyland also updated this portion of the ride. 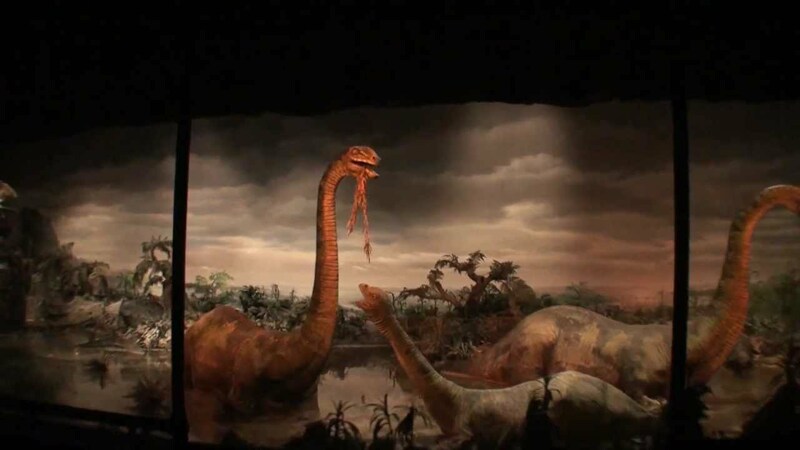 These dioramas which had begun to feel old and obsolete were given new life with better special effects. Unfortunately, due to the speed of our travel and the poor lighting, you are unlikely to capture a picture that really captures these dioramas. They are something you simply must see for yourself! Disclaimer: If you have small children who are afraid of the dark, tunnels, loud noises, or dinosaurs, you might be better off departing at Toontown Station. 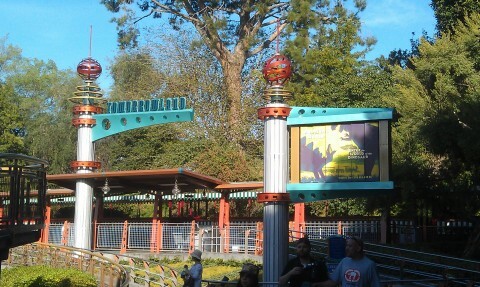 Pulling in right behind Autopia, we have made it to the fourth and final station of the Disneyland Railroad. In Tomorrowland you can travel to a galaxy far, far away and possibly run into some Storm Troopers! If that sounds like your cup of tea, go on and depart. Or, if you are like me and want to see the whole thing through, stay onboard as we make our way back to Main Street Station. The distance between Tomorrowland and Main Street Station is not long at all, so it’s not a bad idea to begin collecting your belongings as you pass through the last tunnel. Throughout the train ride be sure to keep your eyes open for hidden creatures and friendly cast members! As we arrive at the station, your feet and back rested and re-energized, be sure to thank your conductor as your depart! We’ll see you next time on the Disneyland Railroad! Next postI am Proud to be an American. I’m so glad you enjoyed it Ivor! 😂😂 I loved this post. It’s sooo much similar to travelling in a train in India. Wow! What an awesome post. I agree with WaltPage, you would be an excellent travel writer.